The teeth are not just something for children to lose and to grow back. Teeth are an important part of the smile, essential for talking and eating, as well as providing the mouth with the healthiest environment. Taking children to the dentist twice a year is a vital means of their overall health care. Every year children grow and develop means that their teeth and jawbones are growing and developing, too. By giving children adequate dental care, dentists are able to prevent many developmental issues that can occur as the mouth develops, and they are also able to catch many areas of concern and treat them before they become bigger issues. 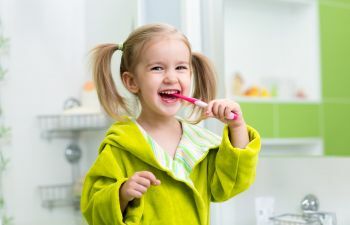 At Gold Hill Dentistry, we offer superior children’s dental care, as well as family dentistry, because we understand that a healthy mouth starts at a very young age. The American Dental Association and the American Academy of Pediatrics say that every child should visit the dentist by age 1. This visit is mostly for the parents to teach them how to care for their children’s teeth and help them to remain cavity free. The sooner children begin seeing the dentist on a regular basis for checkups and cleanings, the healthier their mouths will stay throughout their lives. Early checkups help to prevent cavities and tooth decay – both of which can have devastating effects and cause other medical issues. At Gold Hill Dentistry, Dr. Jennifer Mokris and Dr. Kavi Sagunarthy are devoted to partnering with our patients at a very young age to ensure that they have the healthiest start when it comes to their mouths. Everyone on staff at Gold Hill Dentistry delivers the highest standards of dental care to every member of your family – starting with the youngest one!